Audio-recorder is a handy tool allows to record your favorite music and audio to file. It supports for recording devices, such as microphone, webcam, audio card, music/movie players, Skype calls, browsers, etc. 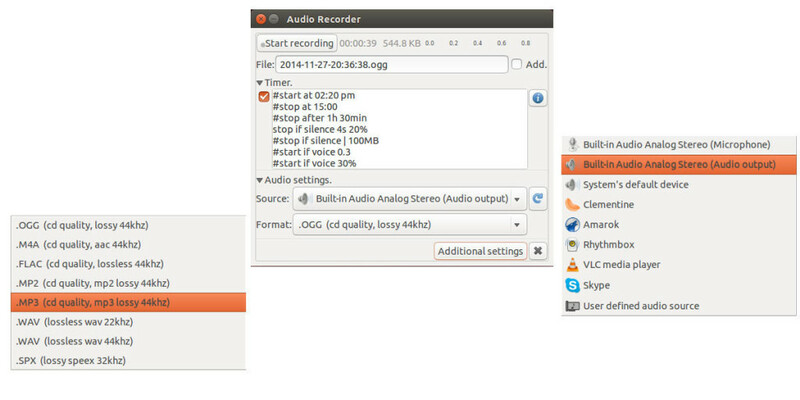 With the Gstreamer plugins, the recorder supports output formats: OGG, Flac, MP3, AAC, and WAV. Start, stop or pause recording at a given clock time. Start, stop or pause after a time period. Stop when the recorded file size exceeds a limit. Start recording on voice or sound (user can set the audio threshold). Stop or pause recording on “silence” (user can set the audio threshold and delay). The recording can be automatically controlled by MPRIS2-compatible media players. It can also record all your Skype calls without any user interaction. This amazing software has been made into PPA, available for Ubuntu 14.10, Ubuntu 14.04. Old versions available from Ubuntu 10.10 to Ubuntu 13.10. If you don’t want to add the PPA, you can grab the .deb package from Launchpad Page and click open it with Ubuntu Software Center and finally install the program.